Rachel Bowman of Tonawanda, NY, was surprised to learn that she could find more than just dogs and cats on Petfinder. But there they were: small and furry animals. She began browsing through photos of hamsters and guinea pigs. “I just happened upon Sherlock and fell in love with his adorable little face,” she says. 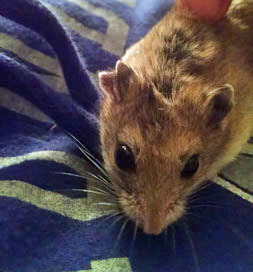 Sherlock is a hamster that was listed on Pefinder by Small Pets – Big Hearts in Cheektowaga, NY. Sherlock is a curious fellow. Some people call these small and furry creatures pocket pets, and Sherlock lives up to the label. “He likes to go in my shirt pockets and ride around the apartment while I’m doing stuff,” Rachel says. So what is the appeal of tiny rodents? Foremost is probably their size. “I live in a very small apartment and didn’t want something that would need a lot of room,” Rachel says. Sherlock has won Rachel’s heart. The why of it seems – well — elementary.